While working on the outline for Titansgrave: World of Valkana, I’d finally hammered down (with an incredible degree of aid from Ryan Wheaton) the various political structures, historical weirdnesses, and generally rich tapestry of the setting’s major landmass. 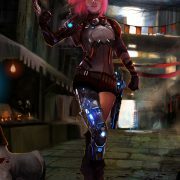 Then, I turned my attention to some of the cool stuff that the PCs can and should have access to as heroes in Valkana. Naturally, thought turns to the heroes of the Titansgrave: Ashes of Valkana webseries from Geek & Sundry. In particular, Lemley’s cybernetic arm which, among other things, houses Dr. Lobotomy. Cybernetics can get problematic in game design sometimes. Obviously, a game that includes them must include a way for player characters to have them – it’s half the fun! 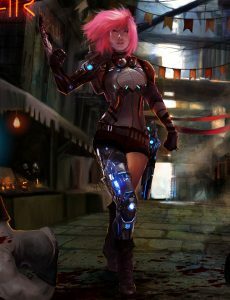 But designing cybernetics as pieces of equipment with all sorts of great bonuses usually ends up with characters who are as close to full-body-upgrades as they can get, ending up with groups of nearly complete-replacement cyborgs instead of plucky heroes with a piece of chrome or two. Today (along with a new Humble RPG Book Bundle) we are pleased to present two new PDFs–one villain for Mutants & Masterminds and an encounter for the Fantasy AGE RPG. 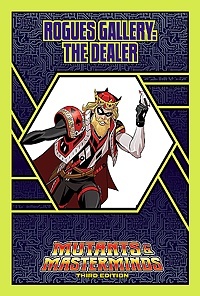 Once a small-time crook, the man now known as the Dealer has spent his life bringing misfortune to others to stave off a supposed family curse! When he cheated his way into some winnings, he used them to become a super-villain to see what would happen with his curse if he could really spread his bad luck around! 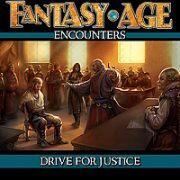 Our heroes are asked by a local sheriff to prove the innocence of an accused knight. Can they save him before it’s too late? 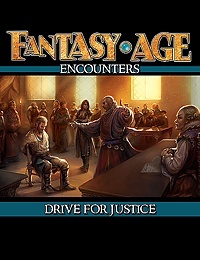 Drive for Justice is a Fantasy AGE RPG adventure for heroes of levels 1-3.